For a little over a year and a half now, Air France Industries KLM Engineering & Maintenance (AFI KLM E&M) has been involved in a major project, the maintenance of GE90 fan cases, and more precisely their static part, the fan stator module (FSM). 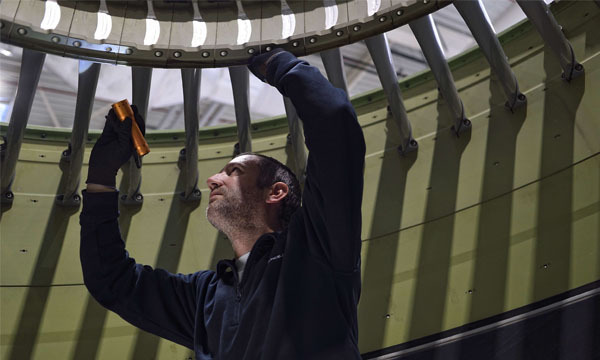 The Air France-KLM group's MRO division means to deal with issues surrounding the ageing of these engines, which generates new maintenance activities, in particular to treat corrosion. Until now, this problem has only been managed by GE Aviation in cooperation with Nordam in Wales. This FSM project is being carried out at Helios, the shop which is dedicated to aerostructures, in partnership with AFI KLM E&M Engines activity. 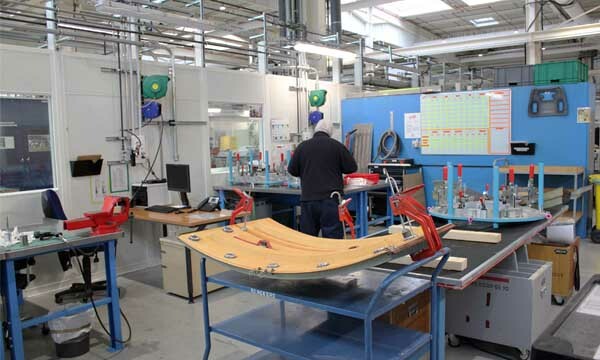 "We are now reaching the operational phase of the project", explains Yan Müntz, Aerostructures manager at AFI's Equipment and Services department. "The project was inaugurated on 24th January". After a two-month running-in period, the FSM platform started work at the Helios building at Roissy-en-France, near Roissy-CDG airport. It now has two complete teams of technicians and is dealing with its first fan case static modules from the neighbouring Engines activity, which is keeping hold of the rotary part maintenance. The first operational GE90-115B FSM (with which Boeing 777-300ERs are equipped) arrived in November; the shop can also process GE90-94Bs (777-200ERs). 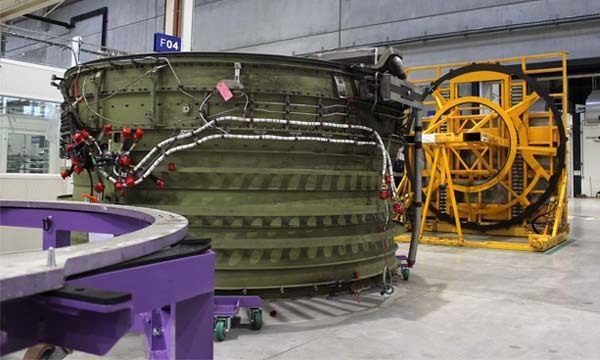 The issue is more pressing on the GE90-115B, which is more widely used and which contains a composite acoustic panel, notes Sylvain Mounissamy, project manager, who joined the Engines activity in summer 2017. After being delivered by AFI's Engines activity, the FSM is placed horizontally on a specific cart to undergo an initial inspection phase to identify the level of intervention required, as explained by Sébastien Flin, production unit manager and manager of one of the platform's teams. Helios also needs to receive lifting columns to adjust the module's height to make it easier to examine. The FSM then heads off to be cleaned with the help of Satys. Depending on the damage observed, the module can either be sent to sanding to be stripped or split into two (front and rear sections) for "more in-depth" inspection, details Sébastien Flin. This inspection is carried out in detail according to a list established by the technical documentation, to determine whether the module meets standards or whether repairs are necessary. Around twenty recurring problems have been able to be identified. Sylvain Mounissamy mentions water penetration and stagnation in the lower part of the case, under the module's interior layer. This phenomenon causes corrosion and in particular leads to the composite acoustic panel coming away from the GE90-115Bs. "You can't see it during a visual inspection", he specifies. "We carry out a non-destructive phased-array ultrasound inspection [system provided by GE Aviation and therefore already calibrated, ed.] to identify this separation. If a fault is detected, the whole composite panel needs to be removed to correct the problem. " The teams can then move onto the actual repair phase. This phase is carried out either in-house, such as for sanding off corrosion or for restoring the abradable coating and the composite acoustic panel, or together with major interventions or by other teams depending on the skills required. Certain parts such as the electric wiring may be sent to CRMA, at Elancourt. AFI KLM E&M is targeting 35 modules processed in 2019, before upping the rate to reach 50 to 60 modules by 2022, given that each one requires between 500 and 1000 working hours. The Air France-KLM group's MRO division is planning to cover 30% of worldwide demand. Of course, the FSM project is mainly intended to cover Air France and KLM's requirements (who have already sent one module each), but also the requirements of airlines which have a full engine support contract which includes this service, starting with Air Canada and Air China. In fact, the Canadian airline has sent the first operational fan case which is currently being processed at Helios. This new capability will help take the pressure off GE Aviation. 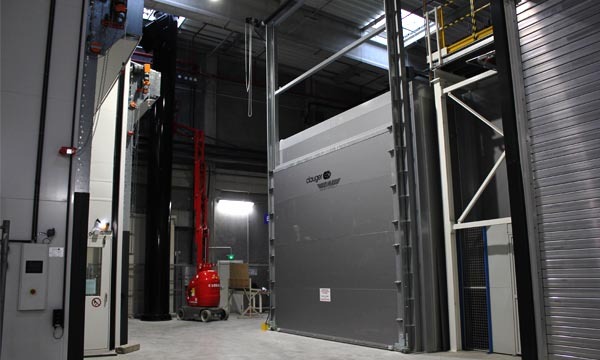 At the moment, the engine manufacturer and its partner Nordam can only cover one third of worldwide demand, while this demand is on the rise. In fact, the first 777-200ERs are now around twenty years old, while the 777-300ER is celebrating the fifteenth anniversary of its entry into service in 2019. "When we sent engines to Wales, they went into a queue and we often had to wait nearly 200 days to get them back", details Yan Müntz. This growing need made it easier for AFI KLM E&M to put this process in place with GE Aviation. The American engine manufacturer has provided its full support to the project. The FSM project was set up very quickly for AFI KLM E&M. The events were driven by a change in GE Aviation's recommendations for GE90 maintenance, as Sylvain Mounissamy recalls: "This sub-system didn't have its own maintenance policy, just maintenance from time to time. Around the end of 2016, GE Aviation put a policy in place which required a much more detailed inspection for the preventive maintenance to be implemented (Preventive maintenance inspection). " For now, GE Aviation is recommending these inspections every 50 000 hours for the GE90-115B and every 60 000 hours for the GE90-94B, according to the "soft time" principle during scheduled maintenance periods. This corresponds to the second shop visit (one every 30 000 hours) and will probably only occur once in the lifetime of each engine. "If the OEM had decided to impose its application ("hard time"), we would have had to ground aircraft due to a lack of parts", warns Sylvain Mounissamy. "Therefore, we created a project structure to develop this very short-term activity". AFI KLM E&M started out on the journey in summer 2017, but it wasn't all fun and games, as Yan Müntz recalls: "This project required a complete major investment programme in terms of heavy industrial resources [the total amount is between six and seven million Euro, ed.]. We had to reorganise the space inside the Helios building to be able to accommodate them". Nearly 800 m² were cleared for the FSM platform, which is located opposite the building entrance and as close as possible to the washing and sanding booths in order to keep the movements of these sub-assemblies to a minimum within the building, given that they are over three metres in diameter. A sanding booth is also being installed and will be operational in April. An additional 800 m² had to be found for part storage. AFI KLM E&M therefore decided to build a new hangar of nearly 3 000 m² which will accommodate all the FSM stocks and the stocks of other platforms which until now have been contained inside the main building. The work will be completed in July, specifies Sébastien Flin. "And then there's the whole human side of things, to identify the technicians and up their skills", continues Yan Müntz. "As the engine activity didn't necessarily have the composite repair capability to carry out the operations on the FSM and the Aerostructures activity by definition was more geared towards the subject, we decided to create mixed teams with technicians from both activities. " The first technicians were recruited at Helios on a voluntary basis from June 2018. They were then immersed in the Engines activity with their new colleagues to familiarise themselves with the equipment they would be handling. A training programme was then set up with GE Aviation, with all technicians sent to Wales for two weeks to work on FSM maintenance operations, tooling or documentation. Activity finally started on the FSM platform in November 2018 after the working area was set up and the first part of the team and the tooling arrived. The first two casings arrived in October to enable the teams to get to grips with them, test the processes and perfect their operations. There are now twelve technicians in place. Five come from engines, five from Helios and two have come in from outside, specifies Sylvain Mounissamy. Each team of six people has its own manager, who also takes charge of another group within a neighbouring platform responsible for thrust reversers. The activity operates on a 2x8 hour shift basis. The number of technicians should rise to sixteen "as quickly as possible", with recruitment still in progress, and with some technicians to be brought in from outside the group. The final target is 24 people, at a Helios building which already has 250. To this must be added two technical office agents and one logistics specialist. This project was set up with the assistance of the Accelean consultancy agency, which has been working with Helios for two years now to improve operational performance. In particular, the agency helped manage each project in collaboration with the managers of both teams. Accelean also helped set up the "change management" aspect, which corresponded "to our desire to take advantage of this project to review how we operate and put a lighter and effective structure in place", specifies Yan Müntz.